Saturday afternoon, Syracuse took a 20-point second half lead and gave most of it back before holding on for a 67-56 home win over Boston College. The Orange (17-7, 8-3 ACC) ran off eight straight points to take a 60-40 lead with just over eight minutes remaining, but allowed the Eagles (11-11, 2-8) to rip off 14 straight points to get right back into the game. SU closed the contest by going 7-of-10 from the line to hang on for the win. The Syracuse defense was key, limiting BC to making just one-third of their shots while forcing 18 turnovers. A dozen of those turnovers were steals, helping to explain SU’s 25-2 advantage in points off turnovers. Neither side was able to string together more than two successful possessions in a row for most of the opening half. 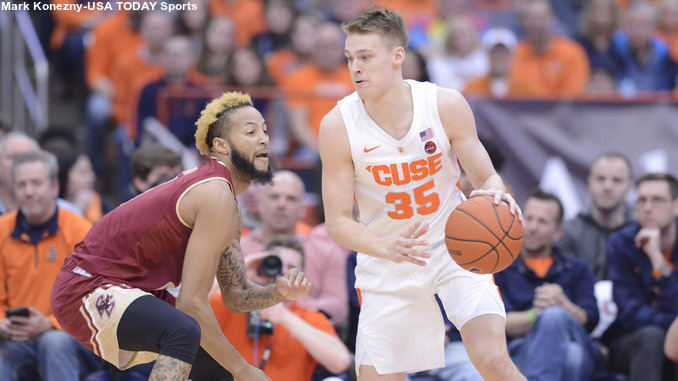 While the Orange led for much of that time, they were not able to build a significant lead until Buddy Boeheim hit consecutive three-pointers and Oshae Brissett added a foul shot to turn a modest edge into a 31-21 lead with 1:21 left on the clock. Boston College would post a three-point play to cut the gap to 31-24 at halftime, then a pair of free throws to open the second half and get within five. About four minutes later, Syracuse ran off nine straight points to create some breathing room. Brissett finished a drive with a short shot to get things going and Boeheim added another three. Tyus Battle grabbed a loose ball and went the distance for a lay-in and Brissett coaxed a leaner through the net for a 45-31 lead seven-and-a-half minutes into the half. The Eagles shaved the gap down to ten, but the Orange capped a 13-3 burst with eight straight points to double the margin. Battle started things with a three-point play and a pair of free throws. Brissett followed a BC trey with a putback and Battle made a steal and went the distance for a transition slam and a Boston College time out. After the game resumed, Battle took off with a long rebound for another fast break basket, then finished an alley-oop from Elijah Hughes to push the Syracuse lead to 60-40 with just over eight minutes to go. That would be the last field goal of the day for the Orange. BC, meanwhile, kept at it, chopping the lead down with 14 straight points to make it a six-point margin with under four minutes to go. Battle ended the SU scoring drought with a free throw 15 seconds later, then added another foul shot 18 seconds after that one. Marek Dolezaj added a pair of free throws almost a minute later to push the lead back to double digits at 64-54 with 2:26 left. The Eagles got a basket on their next possession, but that would be their last tally of the contest, as they missed two foul shots on their ensuing possession. SU added another foul shot, then two more after a Boston College turnover, closing the scoring with a little over a minute on the clock. Tyus Battle was a force in the second half, tallying 15 of his 21 points after the break. Buddy Boeheim came off the bench shooting well, making his first four three-point shots on his way to a career-high 16 points. Oshae Brissett was the only other SU player to reach double digits, posting his third consecutive double-double, this one of a dozen points with as many rebounds. Ky Bowman rang up 21 points for the second time on the season against Syracuse, hitting five three-pointers in the game. Jordan Chatman backed him with a dozen points and Nik Popovic chipped in with ten. Wednesday night, the Orange will visit North Carolina State for a contest with the Wolfpack (17-7, 5-6). The Wolfpack snapped a three-game slide, all against ranked opponents, with a 79-76 victory at Pittsburgh on Saturday afternoon. N.C. State features a balanced offense with a half dozen players averaging at least eight points per game. Shooting guard Torin Dorn leads the squad with 13.7 points and 6.6 rebounds per outing. Three different Wolfpack players have made at least 30 three-pointers on the season while hitting over 38 percent of their shots from beyond the arc, including Braxton Beverly, who had made 55 three-pointers on the season. North Carolina State torched Syracuse last season, shooting over 55 percent from the field as they won at the Carrier Dome, 74-70. Five players had at least seven points for the Wolfpack, but only Markell Johnson (16) and Dorn (eight) are on the roster this season. Oshae Brissett paced the Orange with 25 points while Tyus Battle and Frank Howard combined for 33 more. Tip-of is set for 8:00pm Eastern on Wednesday night between SU and the ‘Pack. The game will be available on television in certain local markets and that telecast will also be available online at ESPN3.com and through the ESPN app.